The best brand of glow sticks on the market. You will receive 1 tube of 100LumiStick luminescent light bracelets. Your order will also contain 100connectors so you can hook the ends together to make bracelets and necklaces.Once they start glowing, LumiStick brand glow light bracelets will last youall night. They will glow super bright for 8 - 10 hours. Then, they will startto fade out but may continue to emit some light for up to 36 hours. TheseLumiStick brand glow light bracelets are fresh from the factory. They comedirectly from the factory and were manufactured just a few weeks ago. We areconstantly getting new shipments from the factory, so you know these are asfresh and new as they come. They have a shelf life of 2 years. 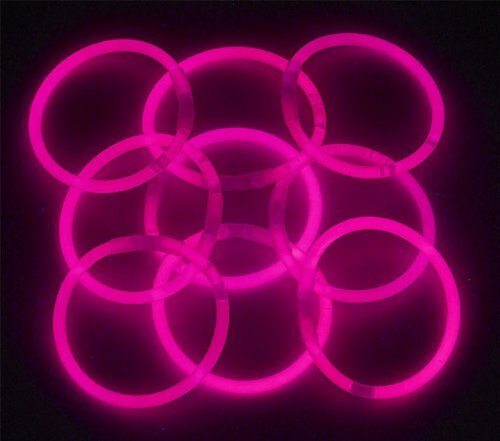 Inside the glowlight bracelets are two chemicals that emit light or glow when they are mixedtogether. Inside the glow light bracelets is a thin glass tube, when you bendit for the first time, you break the inner glass tube. This mixes the twochemicals together. Just shake it up and presto -- it starts glowing likemagic! Lumistick brand gow light bracelets brand glow-in-the-dark products arenon-toxic. They are not radioactive and they are not flammable. The almostnever break open, but if they do, the chemicals inside can be washed off skinand clothes with ordinary soap or detergent.